It is rare to see an aircraft crash from military flying demonstration squadrons as they feature the most skillful pilots from their respective services. As a matter of fact, the last accident for the US Navy's Blue Angles happened during an air show at a Marine Corps air station in Beaufort, South Carolina in April 2007, when Lt. Cmdr. Kevin Davis was killed; the US Air Force's Thunderbirds saw its last crash in September 2003 with Capt. Chris Stricklin parachuting to safety. Therefore, it's such a bizarre coincidence as a Blue Angels F-18 and a Thunderbirds F-16 crashed separately in the same day. One F-16 fighter jet of the Thunderbirds crashed near Peterson Air Force Base in Colorado around 1 p.m. MDT (12 p.m. PDT), following a flyover for the Air Force Academy’s graduation ceremony with President Obama in attendance as the keynote speaker. The pilot of the No. 6 Thunderbirds jet Maj. Alex Turner ejected safely. A mere hour later at approximately 3 p.m. CDT (1 p.m. PDT), a U.S. Navy Blue Angels F/A-18 fighter jet crashed while in formation during an air show practice in Smyrna, Tennessee on June 2, 2016. The pilot did not eject and was killed in crash. 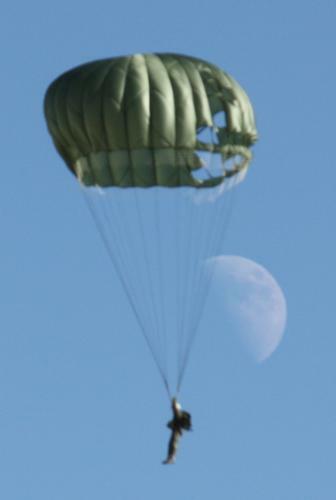 Postcard US-3935005 to Germany shows a paratrooper in descent against the Moon during the Aviation Nation on November 13, 2010.